In the higher rainfall areas, the south east and Mt Lofty Ranges some irrigation is undertaken by pumping from bores. 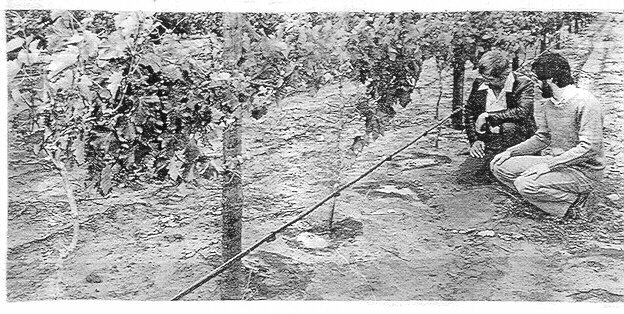 Padthaway irrigation area in the south east is an example where crops such as lucerne, vines and vegetables are irrigated by piped groundwater. 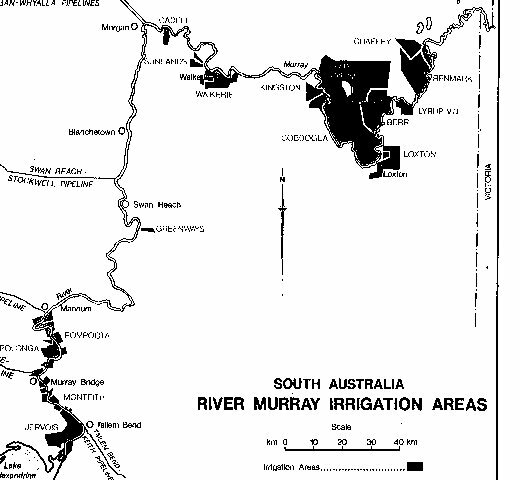 However, the main irrigation area in South Australia is the area along the Murray. Under the terms of the River Murray Water Agreement between the Commonwealth, NSW , Victoria and South Australia, South Australia is entitled to pump out about 1 850 000 ml of water per annum. This allocation necessarily forms the basis of planning for the use of the river water for both irrigation and water supply purposes even though flows may exceed the entitlement at times. Before reaching South Australia, the river has travelled nearly 2 000 km and has been supplemented by the Darling and Murrumbidgee rivers together with many small tributaries. For the whole of its length in South Australia, the Murray flows in a well defined "U" shaped valley up to 40 metres deep and generally 2-5 km wide. The waterway itself meanders along the floor of the valley for 637 km before reaching the river mouth, although the actual length of the valley is about 480 km. The fall of the river over this distance is less than 20 metres with most of this fall occurring in the upper part. From Blanchetown to the sea, a distance of 275 km along the river, the fall is very small; the upper level of Lock One at Blanchetown is only 3.3 metres above sea level. gravity flood irrigation in the reclaimed swamp areas in the lower reaches of the murray. this method is limited to areas which are below river level. the economics of comparatively high lift pumped water supply limit the bulk of irrigation to high return horticulture such as vines, citrus and vegetables as opposed to lower return crops such as cereals.